Call me mint jelly, 'cause I'm on the lamb. It's become very clear that German hard dance group Scooter has become an entirely different beast at this point. Gone are the fast beats and sharp melodies, in are the buzzing synthesizer plugins and quick-to-forget little ditties, a sign of the times as broad musical tastes change. Once a titan of dance music, Scooter has instead followed the chart trends, though to rather little chart-attacking success. Listening to early hits such as Endless Summer or The Age Of Love, and then immediately switch over to tunes like "Mary Got No Lamb", you'd swear they were two different musical groups entirely, if it weren't for the always in-your-face shouting style of frontman H.P. Baxxter. This single starts out, naturally, with the Single Edit. Originally the third track on their 2016 album, Ace, the most notable change in the single version is that they've pitched up the entire song, and that's probably for the better. Going back and hearing the album version, it now sounds very off and a bit too low! (I said that in my album review — maybe they actually read it!) Unfortunately, not much else has changed. H.P. has re-recorded his lines, including the questionable "Don't throw away the banana boxes! Shouting is for the family!" That's not quite as bad as H.P. 's harsh description of Mary, lady of the night, but it still makes no sense. But he's also added one extra line that is bitterly awkward in practice — "You know my name-name-name-name-name..." — and it sounds as though he's straining something fierce. Ultimately, it's the same humdrum electro-synth melody that, which, though not awful, fails to stand out. Scooter threw in two extra mixes to pad out the release. The Arena Mix is essentially an extended mix, with a few exceptions: there are slightly more pronounced crowd noises interspersed among the music, the "rap section" where the beat changes has had the vocals removed, and they've added a couple of cheesy vocal effects. Hearing the word "bowl" repeated over and over doesn't exactly spur positive energy out of me. The other mix is the Extended Mix, and it's essentially the same as the Arena Mix but with the downtempo vocals returned. It's really pointless to have both. 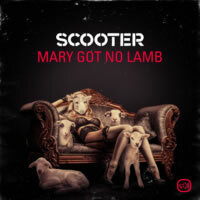 Mary Got No Lamb will probably be fine if it's blended in with other artists' work of similar genre, but on its own, the song is easily forgettable, save for H.P. 's outrageous lyrics. On the positive side, there's definitely energy in this one, and it could definitely blow your speakers off. Now if only they could channel that energy into something creative and fresh, rather than something trying to emulate what is "in" that day, Scooter might be on to something big.